To see them takeoff started almost regular weekly visits every Wednesday afternoon that I had free from work. Initially I did not cycle fast enough and saw them gaining altitude over the green fields. Eventually I arrived to see the take offs at the departure end of the runway and what a thrill it was. It seems at each visit they departed with about a three minute delayed timing. I learned in later years from Sigmund and Jim that they were on Reflex Alert. Most of my time was at the rotation end of the runway, where the air photographs were taken. I was used to the B47’s being at altitude by then. But this one day I decided to photograph directly from the centre line of the runway as the jets went overhead. The RAF police halted traffic but ignored me, a relative youngster. I was about 250 yards then from the end of the runway, not far considering what was coming, and there was no security fence in those days. I could hear the jet engines roar and see black smoke rise over the 12,000’ runway horizon as the take-off run began, the aircraft not yet visible. Then, glinting in the sun the tail fin, cockpit and fuselage rose above the runway surface, then the wings, then the engines, all outlined by a cloud of billowing black smoke. At this point the first B47 was on a slight downhill run still increasing speed. My camera was ready. What a thrill to be unhindered immediately in front of this scene. Then it became different. This aircraft was staying on the runway. I could not believe it. Now I was seriously worried. This large roaring metallic beast outlined against spreading black smoke was heading right for me, rapidly getting bigger and wider. Then it lifted just before the runway end. In fear I took a photograph and placed my camera on a flat topped fence post, stuck my fingers in my ears and shut my eyes. I feared dying in a fireball. It was so low I felt the undercarriage may or may not just miss me. I heard it roar overhead. Then hot dissipated jet wash from behind me pushed me toward the fence. Opening my eyes I saw the camera blown off the fence post. Warm black smelly fumes surrounded. I knew two more B47’s were coming in close sequence and reaching through the fence I picked up the camera and took photos as they followed in quick succession. This time they lifted earlier and powered overhead higher than the first. Maybe the lead pilot was as surprised as I and warned his associates he just ran over someone that is if he ever saw me. It was a very quick and intense experience. I must have been in shock. Walking back to the bike I shook uncontrollably and could not walk straight. I struggled in vain to control this and hide youthful embarrassment from the vehicle occupants and police audience at the barriers. It was a physical not just visual experience never to be forgotten on a normally quiet warm sunny English afternoon. That first photo and the following I have misplaced or last, but I am sure you can imagine it. What you see is from other days. That was just a “few” years ago! My name is Jeff Baxter; my Dad was stationed at “Skullthrope” AFB. His name is Doy Baxter. He was killed in a 47 crash out of Eglund AFB in 57′. I was 3. I am very excited to have found this site. Thank you. There is a wealth of information in this website for you. Keep reading and don’t miss out the newsletters. I was/am very impressed with your story. I was at Brize Norton AB in late fall of 1958 for about 4 month. We came from Lake Charles AFB Louisiana as it was called at that time. Thanks Ed. But this was a minute event among the many real-world memories posted in depth on the Stratojet Association website. With recent events it has got a bit Cold War(y) again, but the many today did not live through that so would not know. Have you got anything to post? Great site. I spent 3 years at RAF Upper Heyford (1957-1960). Working out of Base Operations (3918 Combat Support Group) with a great group of guys. This page brings back memories. Thank you! Love the story and the pictures. I was with the 801st CDS (Combat Defense Squadron) at Lockbourne from April ’63 to Apr ’65 and did my share of reflexes to both Brize Norton and Upper Heyford. What memories!!! A minute event among many numerous minute events in our lives. I will be turning 77 this coming August. Then return home and see them fly over head in formation over the base what a site. Then waiting to recover for my plane. That is another story the recovery. Very interesting story and photo’s Alec – what you were doing at Bruntingthorpe I was doing similar at my local Greenham Common and to a lesser extent at Fairford, Brize Norton and Upper Heyford. 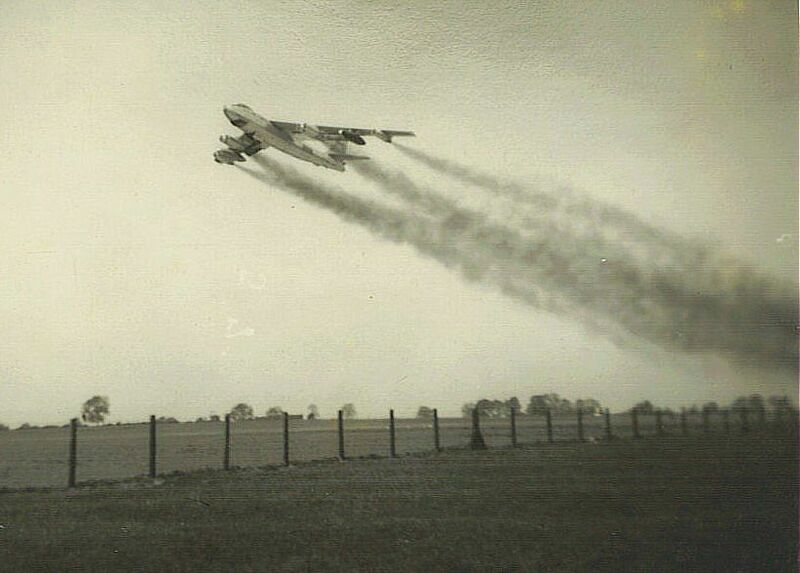 Think you will find that Bruntingthorpe only had a 10,000ft runway – the maximum allowed by the UK Government when SAC requested 12,000 footers for its B-47 operations. Certainly USAF Flight Information Publications of the time show the runway as being 10,000ft x 200ft. Those water/alcohol injected departures, when Reflex a/c were departing home, still stick in my mind as being the most spectacular take offs I’ve ever seen sometimes going very close to the end of the runway before staggering into the air – how those long thin wings supported all that weight still amazes me to this day! Also saw air and ground crews responding to Alpha, Bravo and Coco Alerts, the latter of which required the Alert Force to simulate a MITO launch although for safety reasons I gather that these didn’t get called that often. Looking back to my early teens it was a great time to see Strategic Air Command in action. Graham, did you capture any photographs? Cheers Graham. Thanks for the correcting the runway length. For all of us on a personal basis these are special, unique and pleasant memories experienced by a relative few, and for posterity it is recorded history, and that is enduring. An interesting recollection and photos. Not usual official or semi-official shots of B47 and because of that is more of value. Graham is right, that is MITO with water injecting into jet engines to provide maximum power for take-off. Water injections replaced JATO rocket bottles and was more safer and cost effective. Thank you very much! I did a number of Reflex tours at Sidi Slimane, Morrocco in 1956-57 while stationed with the 305th Bomb Wing, MacDill AFB, FL.. We had JATO in addition to water alcohol available for actual take off with a full fuel load and nuclear bomb on board. It required that much extra thrust with with all that weight. Luckily we never had to depart with a bomb but did a lot of Coco drills in the event we ever had to do it. I did take a few static shots Alec – with a Brownie 127. Unfortunately the results were so bad I gave up. Now of course, I bitterly regret that and wish I’d persevered – so much history lost. I’ve been wondering what the unit is for the B-47 about to depart. If you can give me its tail number or date you took it, I may be able come up with the Bomb Wing. impressive exercises, which included Bruntingthorpe, tested this concept in the UK during 1957 and ’58 – perhaps the picture is from one of those? 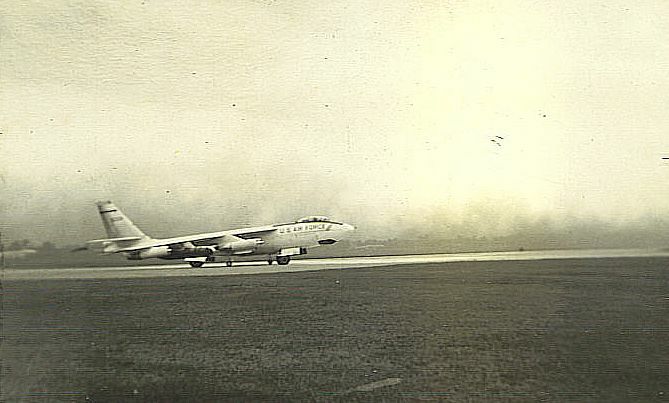 I have a date on the take-off photo of 3-6-59. 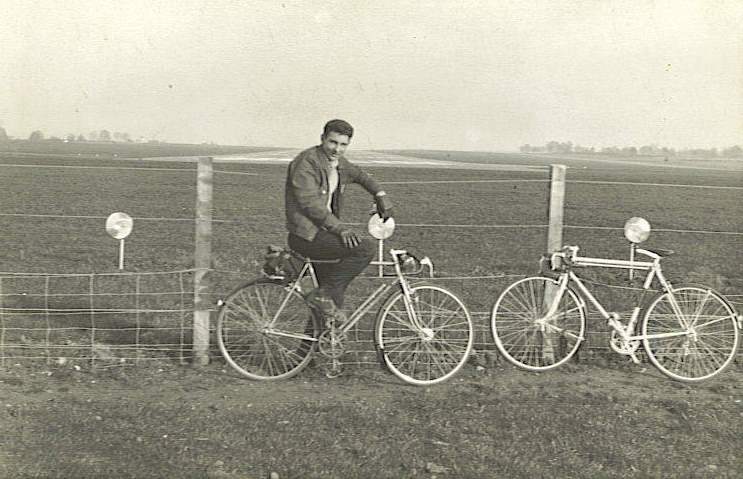 I cannot make out the serial number on the ‘tail’ of the other pre take off photo, the original photo, and on that one I do not have a date. Tell us some more. It is regrettable Graham has not replied. Dave Dunn is right, “what memories”. That is all we have. Upper Heyford was a bit of a novelty for the crew as well as the observers. Since it was located on a hill, it was either a question of added help or drag, depending on the direction of takeoff or landing. I miss Reflex missions. Even the hauling of bombay platforms loaded with milk and eggs to England and the same platforms loaded with Maha Soap, booz, brass trays and camel saddles to New Hampshire. The Birkley would have fit. Checked it out but didn’t have the nerve to carry through with it. Art, I remember the story of the car in the bomb bay, as I heard it it was a little MG. Don’t know if that’s true, but I definitely remember shipping many cases of 40 ouncers back to Topeka behind the antenna of the fire control system. Never lost a bottle. OMG, he is not going to make it! As I continued to watch, he nosed over, the right wing tip dipped and a huge fireball erupted. I was shocked and sickened by the thought that 3 crewmen and the crew chief were on board. RIP. Back in the day, it was said that an Austin-Healey Sprite with windscreen removed could be accomodated by the bomb bay pallet in a B47 for delivery from UK to US of A. (Never actually saw it but most of the crewforce believed in it.) Guess we figured if you could upload a Mk53 a Sprite could go up. Our 310th (Smoky Hill/Schilling) finished our UK era reflex in ’59. Then on to Alaska, Morocco, Spain and Guam. When were you in Guam? I was there 59 and 60. That PO Box 24 Camden NSW Australia address, at the end of the article, is no longer valid. it did serve well for more than thirty years. I was in 443rd bomb sq 320th bomb wing, march AFB, Ca 1953-1956.
we phased out the b29s and brought in the b47s. @ MAFB. 15 each sq 45 each wing or 90 b47s and 90 b29s in 1953. I was an aircraft mechanic and before I left in 1956 we were preparing to phase out the B47 and in the B52. I was offered additional rank to rein list and a training tour at Boeing to learn the B 52 which is still on duty. THe B47 introduced the usaf to HEAVY JETS 40 , lb b29s to 130,000 lb to 450,000 lb b 52s. It was a time of COLD war and giant leaps in flying technology, in fact I spent almost my whole 4 years in some kind of school and training. The B 47 was so much different than anything before, I supervised a crew in waxing a b47to set a new speed record from California to Maine. I remember the day my chief put me in charge of updating the flying and maintenance books of our incoming 15 b 47s. By usaf regulation the books had to be up to date or the aircraft was considered not airworthy and could not be flown. About 10,000 pages of changes had been issued before ours arrived. I was proud that the 443rd bomb sq was the first to have airworthy B-47s and General Lemay, SAC commander came to our squadron to fly our B 47s. OUR job was flying with bomb in the air 24 hrs a day cabable of hitting the soviets. It is good to see such feedback and input still coming in. Any more? Don’t hesitate. FYI my since PO Box has gone my email address is alecbailey@yahoo.com (in Australia). In 1963 SAC decided to add a number of 2nd Lt Copilots to their B47 crews. At that time there were Majors flying Copilot and evidently not much movement in crew replacements was evident. I was one of those Copilots assigned to the 100th Bomb Wing at Pease AFB NH. My tour lasted until Dec 1965 when my assignment became C130s in Taichung, Republic of China (Taiwan), Ching Chang Kong AB. THE 100th Bomb Wing was tasked with a local Ato mic Bomb Alert mission and a reflex Alert mission situated at Torrejon AB, Madrid, Spain during my tenure. Dave, thanks for that contribution. They are getting fewer and fewer. I was a B-47 2nd Lt. co-pilot, flight engineer, EWO, tail gunner, radio man and assistant navigator at Forbes AFB from ‘60 to 64. Went airlines in ‘67. Taught many new hires during my career using the B-47 to illustrate the why of many design features of modern commercial jets. I retired from DAL in ‘99. Joe, I was there during that same period, did you happen to frequent the Lake Shawnee Lodge? I too had an interesting 4 years in SAC. 1955 to 1959. I was stationed at Smokey Hill AFB ( later as Schilling AFB.) 310 BOMWG. After tech school at Sheppard AFB. as a Aircraft Hydraulic Repairman 42132.. Transferred to Smokey Hill May 10, 1955. We had 45 B47’s , 3 squadrons of 15. Plus KC97’s refuelers. I’ve been trying to get in touch with anyone that may have been in the hydraulic shop. I started at Walker AFB NM in 57.509 Bomb Wing.The entire wing moved to Pease AFB in 58.I transferred to 98 Bomb Wing In 60 and got out in 65.Tdy Reflex to all three bases in Spain and Upper Heyford in UK.I never heard of Brunthorpe so dont know why.I was at Lakenheath once.Just a crew chief but I lover that old bomber. If anybody in this topic has old photographs of this era? Leave me a reply so I can get in touch with you.